In this video we will discuss DDL Triggers in sql server. 1. DML Triggers - Data Manipulation Language. Discussed in Parts 43 to 47 of SQL Server Tutorial. DDL triggers scope : DDL triggers can be created in a specific database or at the server level. The following trigger will fire in response to CREATE_TABLE DDL event. In the Object Explorer window, expand the SampleDB database by clicking on the plus symbol. Please note : If you can't find the trigger that you just created, make sure to refresh the Database Triggers folder. The above trigger will be fired only for one DDL event CREATE_TABLE. If you want this trigger to be fired for multiple events, for example when you alter or drop a table, then separate the events using a comma as shown below. Now if you create, alter or drop a table, the trigger will fire automatically and you will get the message - A table has just been created, modified or deleted. Now let us look at an example of how to prevent users from creating, altering or dropping tables. To do this modify the trigger as shown below. To be able to create, alter or drop a table, you either have to disable or delete the trigger. Certain system stored procedures that perform DDL-like operations can also fire DDL triggers. 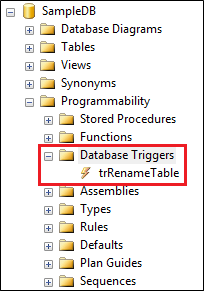 The following trigger will be fired when ever you rename a database object using sp_rename system stored procedure. I have a table category and a table product. When delete one key in cateogry, i want to delete all item in product have parentid like this key. How can i build tringger for this function? i have inserted a items in cart and i didn't go for the checkout, i have to delete that item from cart automatically if i quit the shopping and didn't checkout. How cani solve this? ?